The Korean nachos at Madison's 12|12. Photograph by Jared Sych. Nachos are pretty much always a good deal — even at around $30 — since you usually need about three people to finish a platter. But they’re even better when they’re a really good deal. Here’s where to get nachos for less every day of the week. Plus, most of these spots also offer deals on cocktails and beer at the same time. 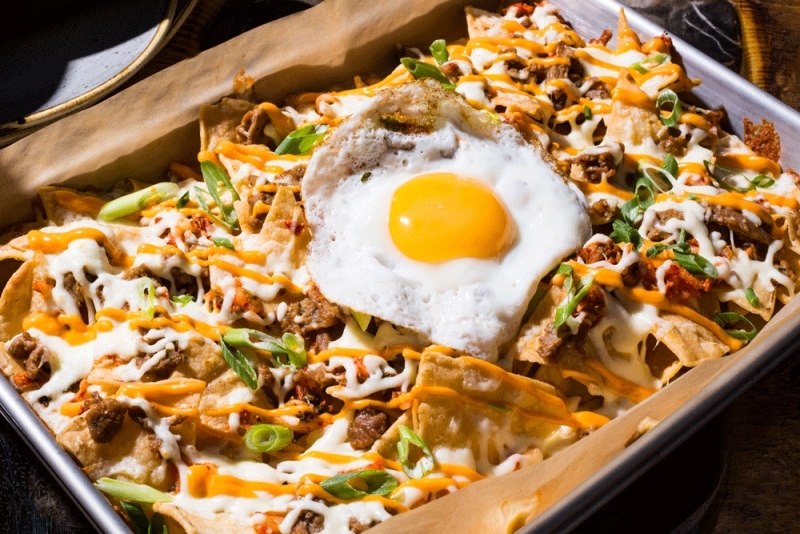 World Bier Haus’ Sabroso nachos are more than half off at select times on Sundays. They come topped with cheese, jalapenos, lime crema, green onion and pico de gallo. When to get the deal: Every day from 3 to 5 p.m. and from 9 p.m. until close. Take advantage of the build-your-own, half-price nachos during Blanco Cantina’s “Halfy Hour.” There’s also half-price tequila and margaritas and beer are $6. Deal: $16.99 Double Nachos (regular $21); $22.99 Triple Nachos (regular $29.99). Every Saturday from 2.p.m. until close, these five sister pubs offer varying portions of nachos for a few dollars off. The Double Nachos are good for two to three people while the Triple Nachos are good for a big group. They come topped with cheese, peppers, tomatos, jalapenos, black olives and green onion, plus you can add proteins like pulled pork, brisket or chicken for an extra charge. When to get the deal: Monday to Thursday after 10 p.m.
Calgary’s first and only nacho-focused restaurant offers half off all of its nachos Monday to Thursday starting at 10 p.m. There are 12 kinds to choose from, including Korean nachos with bulgogi beef and poke nachos topped with marinated ahi tuna. Every Sunday at Trolley 5, get a half order of the Route 5 Nachos for $11. It’s the perfect size for two and comes with generously portioned sides of salsa and sour cream. Wash it all down with a pitcher of one of Trolley 5 two lagers. This Mexican street food joint offers a great nacho deal where you can get half off Tropical’s original, buffalo chicken or barbecue cheeseburger nachos all day on Wednesdays. Bonus: the original comes with guac!